It was a bit cold this morning as I entered the famed brickyard. The air temp was 43 degrees and the track temp was 55 degrees. This morning’s practice that was scheduled started late due to the cold temp. For the cars to be able to go out on the track they needed the ambient temperature plus the track temperature to equal 100 degrees. It took awhile but they did make it out for about 45 minutes total. Once the practice was done, it was off the Indy Fans Tweetup behind the Pagoda at 10:00am. OpenWheelMom and Shayzen were heading this event up and checking people in. 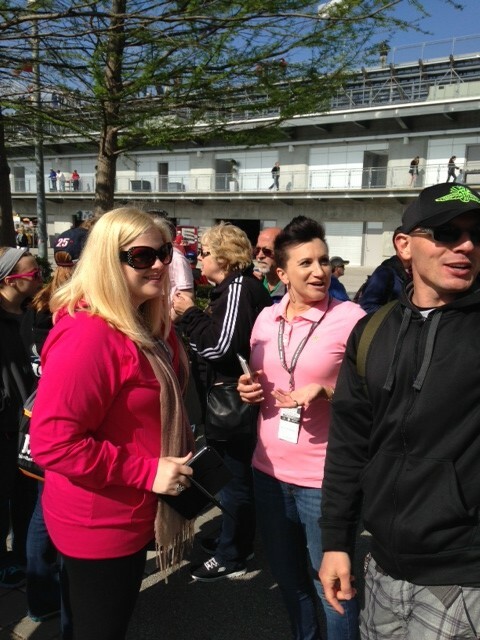 It was fun connecting with IndyCar fans. There were some familiar faces just like last weekend at the Indy GP but some new faces that decided to show up. It was a fun event for sure and if you didn’t go, you missed a great opportunity to talk racing. I made it over to the garage area by 10:30 to see what was going on and if there were any drivers out. This is just a half hour before qualifying begins. Most of the cars were lined up at the inspection areas to get the final approval so they could go out to the qualifying line. 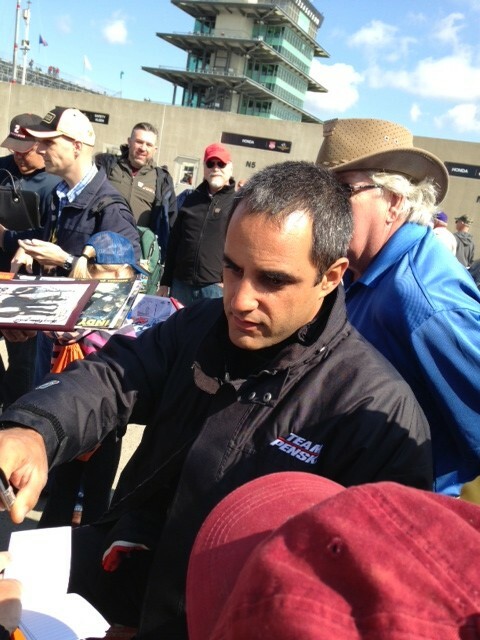 Juan Pablo Montoya was out on his bike and took time to sign some autographs for some fans. It’s always great to see a driver of his caliber taking time to make a fan’s day. Sage Karam came out of the garage to sign autographs for some fans as well. In the early stages of qualifying, Ed Carpenter has been the only driver to qualify at 230.114 with rookie Jack Hawksworth in second at 229.732 and James Hinchcliffe in third at 229.672. As the day unfolds, it will be interesting to see if anyone can challenge Ed at over 230mph for the pole. Keep an eye on the track temperature and the ambient temperature throughout the day. You can follow live timing and scoring and keep up to date on all the action. I can’t wait to see which driver’s make the fast nine! If you are confused about today’s qualifying the most important aspect about today is that this will determine pit selections for the race. The fast nine from today will be the drivers going for the pole on Sunday. How many will jump out of line 2 and go to line 1 later in the day to sneak into the Fast 9?